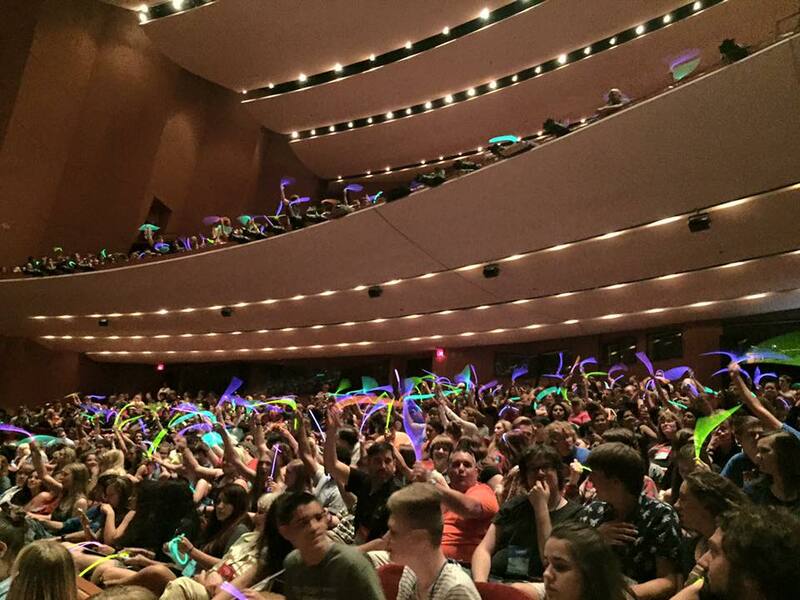 I attended the International Thespian Festival in Lincoln, Nebraska a couple of weeks ago. As a college professor, I was there to recruit for my school and saw over 600 students audition for college theatre programs and scholarships. I’m always fascinated to discover pockets of the country that seem to have more than their fair share of great student actors. You quickly notice that many strong talents seem to come from the same high schools. How does that happen? What is the advantage? Is there something in the water? Maybe. But at a conference attended by students, teachers and industry professionals from all over the country (and the world!) – why are the best students coming from roughly 7-8 schools? The most obvious answer, of course, is that the drama teachers at these schools must be excellent. They are teaching real skills and professional technique, as evidenced by their students’ performances and auditions. They’ve done a full year of productions – often outside of their curriculum, they have the chutzpah to get themselves to a National event, usually after local and state levels, and somehow they have raised the financial resources to make it all happen. However, many of these students also have real talent. And while several of them are lone high school theatre stars, many of them go to school together. Let’s continue to dig a little deeper into that part of our survey. In the summer of 2014, 100 actors in Broadway Musicals were asked a series of questions about their education, backgrounds and early careers. As a parent of child about to start kindergarten, I have a renewed interest in the birth dates and school-readiness of children in the same “grade”. Kids can be in the same class – but possibly 10 – 11 months apart in age, a big difference for 4-5 year-olds. In his popular book, Outliers, author Malcolm Gladwell discusses this subject at length. He noticed in his native Canada that the majority of professional Hockey players have birthdays in January, February and March. Everyone knows that Canadians are wildly passionate about hockey and most of them play the sport – at least as kids. Gladwell explains that hockey has an age-based class structure following the calendar year with a cut-off at the end of December. Therefore the oldest 9-year-olds (for example) generally have an advantage because they are larger and more coordinated than their younger teammates who might have been born later in the year. Because of this, these older children are placed on more advanced teams, given better coaching and compete at a higher level than children eight to twelve months younger than them. This advantage leads to better skills and achievement at a faster rate – which can lead to professional careers in Hockey. However, for Broadway actors in this survey, this phenomenon is somewhat reversed: most respondents said they fell somewhere in the middle (53%) or on the younger side (34%) – compared to their classmates. Of course, maturity doesn’t always come with age (thank goodness) – but perhaps we can make a connection between younger children in class with less social, emotional and physical control and those theatre kids drawn to the stage where they find freedom and approval (and attention). As a former theatre kid, with an August birthday, this sounds very familiar to me. Rest assured that actors on Broadway are from every corner of the globe – including non-hockey-playing Canadians. But, when asked where they grew up and in what-sized town, there were a few surprises. The largest group of respondents (28) is from the Midwest/Great Lakes region – and most of them are from a medium-sized city. The next three groups were about the same size – Northeast (16), Southeast (15) and Mid-Atlantic/East Coast (13) – and all equally split between large, medium and small towns. This trend could mean than being relatively close to the Big Apple, perhaps traveling there on vacation or a school trip, enables student actors to consider the city a real possibility. Actors from Texas and the Southwest are predominately from large cities, Rocky Mountain and Plain State respondents were from medium-sized cities – and the West Coast representatives were evenly split between medium/large cities. Very few actors (5 total) came from the Deep South/Mid-south – and military families (2) or international backgrounds (2) made up the rest. Geography has a lot to do with this data. If you’re from Massachusetts – living in New York City isn’t that far from family and home, but that is a different reality for kids from Oregon or Arkansas. Amazingly, I found similar geographic patterns with students at the Thespian Festival. (*Lincoln, Nebraska – and the festival – are not easy to get to or even necessary for every theatre hopeful – so please forgive my broad generalizations.) It isn’t hard to imagine that a large group of talented theatre students from high schools with strong theatre programs would mirror the background results of professional actors currently working on Broadway. The exception was that far fewer theatre students from the Northeastern part of the US – whom I presume plan to study closer to home – attended the conference. But among the strongest students that auditioned, Texas/SW students were almost always from Houston, Dallas, Las Vegas and Phoenix (large cities); students from the Rocky Mountain and Plain States were mostly from Denver, Colorado Springs or Kansas City; West Coast kids followed the same trend as above – (very few were from California where film is the more visible performance avenue), and there was an even distribution of students from the Mid-west and Southern towns – large and small. The Broadway actors overwhelmingly described their hometowns as supportive of the arts (83%) and 88% of them grew up seeing theatre performances in their metropolitan area. This kind of access is explained in the geographical data. If you live in a larger city you have the chance to see professional theatre and perhaps national touring companies of Broadway shows. But if you live in the middle of nowhere – the idea of making a career in the theatre may not even occur to you. Family influence also plays a huge part in the life of young actors. 17% of actors in our survey had immediate family members or other close relatives that were professional actors, singers, dancers or musicians. Another 27% had relatives that participated on an amateur level in community theatre, church choir or other hobbyist capacity. Notably, for the majority of these actors (56%), this wasn’t the case. They are pioneers! But somehow, somewhere, they were gaining an appreciation for Broadway Music – ranking TV/Movies as the most common place to learn about and love this material – with family, school/classes and friends all coming in at a close second. This led to first performances at an early age: 21% at age 5 or under – and a full 85% listing their first official performance by age 12. If you’re 13-years old, GET ON IT. But seriously, an environment offering early exposure and access to Musical Theatre and all of the performing arts is the largest common denominator for a successful career on Broadway. Thanks for visiting! I hope this site will be a useful tool for students and teachers as well as professional actors, singers, dancers, creators and makers of musical theatre. “I want to do THAT!” Many young Broadway hopefuls speak those words the first time (and every time?) they see a show on the Great White Way. The storytelling, the talent, the production values are so impressive and exciting that performing on a Broadway stage instantly becomes a major goal. But, how do you get there? Practice of course, but what else does it take? How did those people up there – actually get there? During the summer of 2014, 100 actors in Broadway musicals from Book of Mormon to Phantom of the Opera, were asked many questions about their journey. Everything from their education and training: including the kind of school they attended and what degree they earned; to their performance backgrounds, agents, first jobs, where they grew up, family life and even birth date. The results offer distinct trends and subsequent advice regarding the many steps needed to get to Broadway. How old were you when? Because Broadway offers the highest paychecks for stage actors and is often seen as the pinnacle of success after several years of working your way up the ladder, age was a surprising factor. The majority of respondents were relatively young when they made their debut: 35% were between 22-25, 30% were 25 – 30, with another 11% getting there between 18-21, for an overwhelming 76% making it to Broadway by age 30. A slight majority (51%) moved to New York before they earned their equity card. Without a union card, most actors can’t even get into a Broadway audition – so these actors were young, and determined. 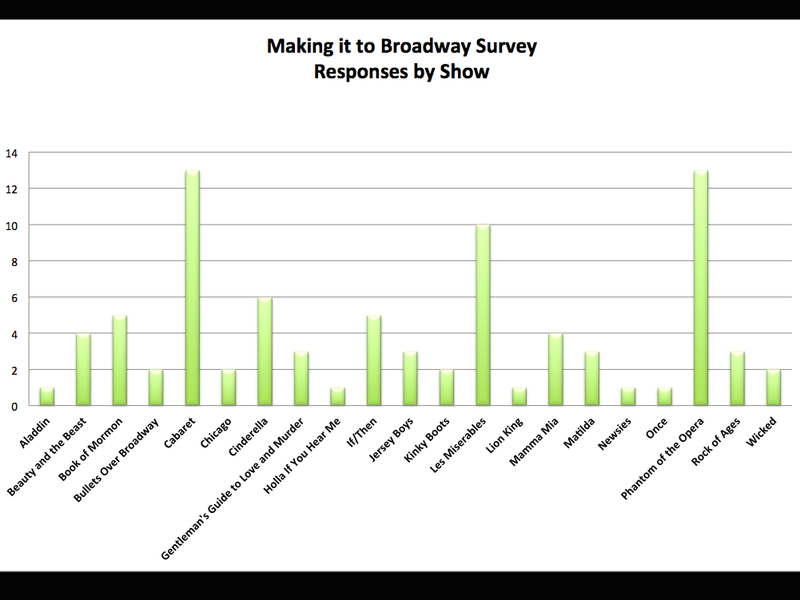 Moreover, almost 76% had an agent before they booked their first Broadway show. Education and training are important in every field, and acting is no different. 73% of responders were in specialized singing and dance classes prior to college, 30% in a full-time arts high school. A full 80% of responders auditioned to get into their college degree programs which speaks to the truth that highly selective admissions procedures and the competition to get in – and the competition while you’re there, will often breed success upon graduation. 46% received a BFA degree and would describe their school as extremely competitive (32%) or very competitive (24%). There were other major trends in education too: 70% had professors with professional careers and when asked if their school had economic and racial diversity, 75% said yes. Just 5% did not attend college, and the rest were split pretty evenly between conservatories, liberal arts colleges, and large universities. They earned degrees in predictable fields: 42% in Musical Theatre, 20% in Acting, 12% in Vocal Performance/Music, and 5% in Dance, but it is important to note that almost 20% did not earn a degree in performance. When asked if they were still repaying student loans, 78% said no. This points to an unfortunate truth in musical theatre training, financial means to pay for college – and pre-college performance classes are a distinct advantage. This could also mean that many Broadway performers come from families with higher incomes. As these Broadway actors began their careers, many found professional success early. 41% were first paid to perform while they were still in high school, and just over 45% in college. 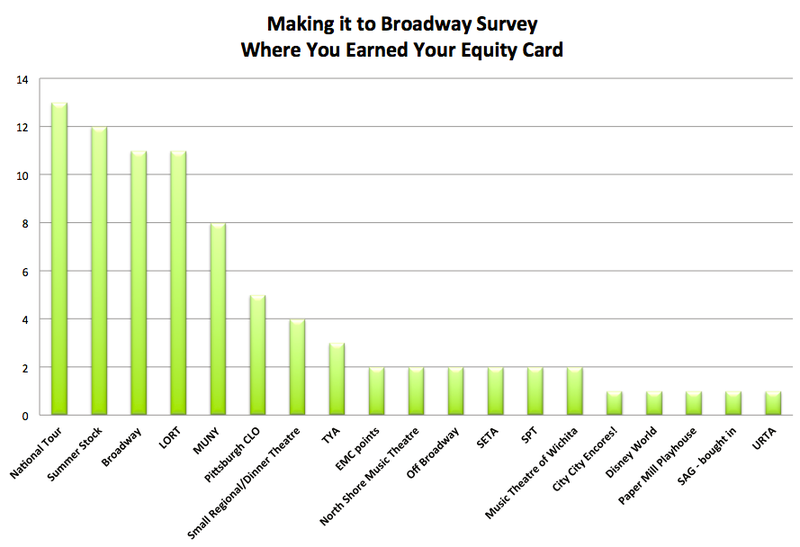 Most earned their Equity cards in summer stock, Off-Broadway, or Regional Theatres – but 23 of them earned their card by getting cast in a Broadway show or National Tour. What we will learn from this survey is that at the Broadway level great talent should be a given, but a competitive education, major financial support, an excellent work ethic, and more than a little bit of luck are essential advantages to making it on Broadway.